It's more expensive than its battery-powered cousins, and it requires hardwired power, but it produces fewer false alerts. The Ring Video Doorbell Pro is more expensive than its battery-powered cousins, and it requires hardwired power, but it produces fewer false alerts. The Ring Video Doorbell Pro is a smaller and smarter member of Ring’s popular video doorbell family. It’s $50 more expensive than Ring’s second-generation battery-powered device, but this additional investment could considerably cut down on the number of false alerts you receive and leave you a much more satisfied owner. That’s what happened to me when I swapped out the Ring Video Doorbell 2 for the Pro version. The secret to the Pro’s porch success at my house is its more complex detection zone setup. The Ring Video Doorbell 2’s motion detection is based on passive infrared sensors that look for moving heat sources, such as humans, animals, and cars. Users are able to set detection based on broad and fairly vague areas that require a bit of trial and error to get right. 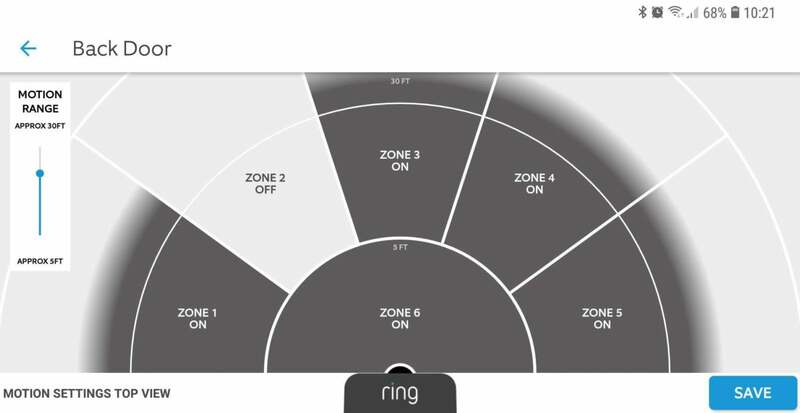 These are the user-selectable motion-detection zones on the Ring Video Doorbell 2. On the Ring Video Doorbell Pro, detection is based on actual analysis of the video signal. This can be problematic initially, because its sensor notices everything, including trees moving in the wind. But that’s where detection zones come in. Users can draw up to three areas on the screen and limit alerts to just what happens inside those boxes. 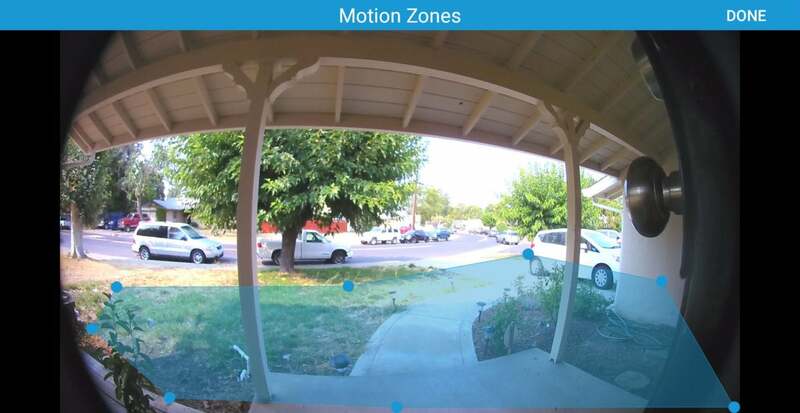 Motion detection zones for the Ring Video Doorbell Pro can be somewhat abstract shapes, enabling you to avoid bushes and other objects that might lead to false alerts. The difference is clear and so are the results. With the Ring Video Doorbell 2, I was getting a handful of false alerts every day, despite all my tinkering with the settings. The culprit was trucks driving by and car headlights in the evening. With the Ring Video Doorbell Pro, I managed to almost eliminate false alarms, so that just about the only thing that set off an alert was an actual person at my front door. I occasionally got an evening alert when a car with exceptionally strong headlights went by—I presume because it illuminated the lawn and that was interpreted as movement—but the level was much lower. Ring’s first two video doorbells will run on either battery power or low-voltage wiring, such as you might have with an existing conventional doorbell. The Ring Video Doorbell Pro must have a wired connection. That’s because the detection system is processing video all the times—a battery would soon be dead. You’ll need to connect the Pro to a doorbell transformer that supplies 16- to 24 volts of AC power. If your home already has a wired doorbell, it’s probably at this voltage, but you’ll need to check. And not every home has doorbell wiring. If yours doesn’t then you’ll need to install power at your porch (or get an electrician to do it) if you want to use this. The lack of a battery also means the doorbell won’t run during a power outage, but that’s probably not a big concern for most people because if your home loses electricity then you probably lose Wi-Fi and broadband access as well. By removing the battery, Ring has been able to make the Ring Video Doorbell Pro a bit slimmer and smaller than its first- and second-generation models. The Pro measures 4.5 inches x 1.85 inches x 0.8 inches (11.4 centimeters x 4.7 centimeters x 2.0 centimeters). That’s 6.7 cubic inches (108 cubic centimeters) versus 13.6 cubic inches (223 cubic centimeters) for the Ring Video Doorbell 2—an impressive reduction in volume of more than half. Ring put a better Wi-Fi module in the Ring Video Doorbell Pro, one that supports both 2.4- and 5GHz wireless networks. The 5GHz frequency band typically offers less range, but it’s also generally less crowded, so if you have connectivity problems in your home, switching to the 5GHz band could help (assuming you have a dual-band router). Whatever connection your doorbell ends up using, Ring recommends having a broadband upload speed of at least 1Mbps, with 2Mbps preferred. That’s typically not a problem with cable modems, but it can present a challenge to DSL gateways. The video doorbell won’t use this uplink connection all the time, it’s active only while you’re streaming video or when its motion detection triggers video capture that’s uploaded to the cloud. The Ring Video Doorbell Pro matches the 1080p high-definition video of the Ring Video Doorbell 2, with a 160-degree viewing angle versus the lower-resolution 720p and wider 180-degree viewing angle of the first-generation Ring Video Doorbell. Each of the three models has two-way audio for speaking to callers at your front door, infrared night vision, and a weather-resistant enclosure that’s designed to work in conditions ranging from -5 degrees Fahrenheit to 120 degrees F (-20.5 degrees Celcius to 48.5 degrees C). The Ring Video Doorbell Pro improves on the Ring Video Doorbell 2 and is well worth considering if your porch faces an area that’s likely to have lots of traffic, people walking by, or trees swaying in the wind. The extra $50 could make you a much happier owner, even if you need to bring power to that location. But if the area around your front door is calm and quiet, save the cash and go with the excellent Video Doorbell 2 instead. While you’re considering the purchase, remember that you’ll need a Ring Protect subscription to make full use of the features offered. That costs $3 per month or $30 per year. The Ring Video Doorbell Pro brings more advanced motion detection and comes in a smaller package, but you'll need doorbell wiring for it to work. If you live on a busy street, the extra smarts could make you a much happier homeowner thanks to fewer false alerts.